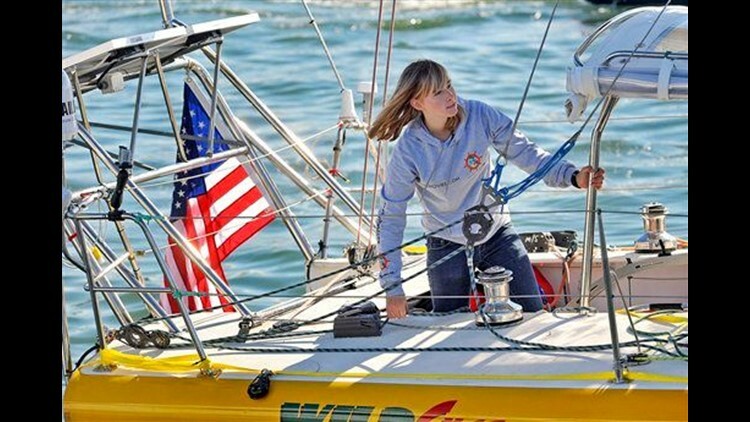 MARINA DEL REY, Calif. (AP) — A 16-year-old Southern California girl attempting to sail solo around the world has ended her quest to become the youngest to make the trip nonstop and will head to South Africa for boat repairs. Abby Sunderland wrote on her blog Saturday that it she could not keep going after losing use of her boat's main autopilot. She expected to land in Cape Town in about two weeks. "It would be foolish and irresponsible for me to keep going with my equipment not working well," Sunderland wrote. "I'm about 10-14 days from Cape Town right now and though my auto pilot is working for now, we're all holding our breath and hoping it will last." Even with her nonstop attempt over, Sunderland writes she will try to complete her trek around the world. "I will definitely keep going and whether or not I will make any more stops after this I don't know yet," she wrote. "I admit I was pretty upset at first, but their is no point in getting upset. What's done is done and there is nothing I can do about it." Sunderland, of Thousand Oaks, embarked Jan. 23 after older brother Zac completed a westerly solo circumnavigation at the age of 17. The record for the youngest person to circumnavigate is held by 17-year-old Mike Perham of Britain. Last month Sunderland completed the task she saw as the trip's most difficult — rounding the Cape Horn on the southern tip of South America. She was believed to be the youngest person to sail alone around the cape, known for treacherous winds and waves. Sunderland stopped in Cabo San Lucas for repairs shortly after departing, but was still on the west coast of North America and restarted the trip. The stop leaves the door open for another 16-year-old girl, Australian Jessica Watson, who is expected to complete her own solo unassisted voyage within days. Watson is ahead of schedule on her 23,000 mile journey and could arrive in Sydney Harbor as early as May 2. She is five months older than Sunderland.